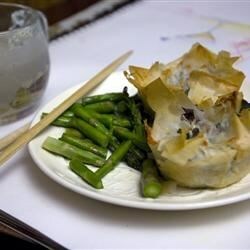 "A delicious pie with asparagus, mushrooms, garlic and hollandaise sauce baked in puff pastry." Melt the butter in a large skillet over medium heat. Add the asparagus, and cook for about 10 minutes. Stir in the mushrooms and garlic; cook and stir until the mushrooms are tender. Set aside. Prepare the hollandaise sauce according to package directions. Stir into the asparagus and mushrooms. Lay one sheet of puff pastry out flat in the bottom of a 9x13 inch baking dish, letting any extra dough go up the sides. Spread the asparagus mixture evenly over the dough. Top with the other sheet of pastry, and pinch the edges together to seal. Bake for 25 to 30 minutes in the preheated oven, until pastry is golden brown. Cool for a few minutes before slicing and serving. I followed the recipe exactly as written and I ended up with a tasteless, soggy pie. Thanks for sharing, but I won't be making this again. For those of you with a soggy crust this may help: Brush bottom crust with lightly beaten egg white or whole egg. I use this trick for pies that may cause a soggy crust.